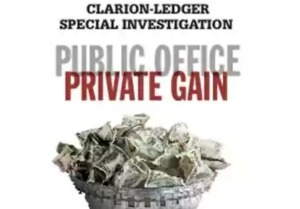 The reports are the first for statewide and legislative politicians since a push for campaign finance reform in the Legislature and since a special Clarion-Ledger report, “Public Office/Private Gain” showed how the state’s lax laws and nonexistent enforcement have created a tax-free second income for many, funded by special interests. Experts and political observers have called Mississippi’s lack of rules and transparency on campaign money “a recipe for ethical disaster” and “legalized bribery,” with special-interest money making its way into politicians’ pockets after it runs through their campaign accounts. Campaign money is shielded from tax, ethics, bribery and other laws because it is ostensibly to be used for campaigning and records of it are supposed to be open to the public. Below, The Clarion-Ledger revisits some of the politicians who had interesting or questionable campaign reports for prior years that were highlighted in the ongoing Public Office/Private Gain reports. It compares them to this year’s report. Also below is a glance at statewide elected officials’ campaign finances and donors and a look at pending campaign finance reform laws.